Dr. Karim Seghir is the Chancellor of Ajman University in the United Arab Emirates. Dr. Seghir has an extensive and geographically diverse professional experience. Born in France and raised in Tunisia, Dr. Seghir earned a Bachelor of Science in Mathematics in 1997 from the University of Tunis. He then earned a Master of Science in Mathematical Methods in Economics and Finance and a Ph.D. in Mathematical Economics and Finance from University of Paris 1 Pantheon-Sorbonne in 1998 and 2002, respectively. He served as a post-doc researcher at Universidade NOVA in Lisbon from September 2002 to September 2004. He has also served as a visiting professor at Pontificia Universidade Catolica in Rio de Janeiro in 2003 and at Universidad de Chile in 2010. Dr. Seghir served as assistant professor of Economics at the American University of Beirut from September 2004 to September 2006. He was then appointed as assistant professor at the American University in Cairo (AUC). 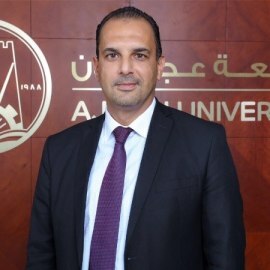 Dr. Seghir was appointed as associate dean for undergraduate studies and administration of the AUC School of Business in June 2011 and then dean in July 2014. As associate dean for undergraduate studies, Dr. Seghir has managed AACSB, EQUIS and AMBA accreditations and is a member of the Advisory Board of Harvard Business Review (HBR) Arabia. He has served as a speaker in various regional and international events including AACSB, EFMD, PRME, Economic Research Forum and the World Bank.